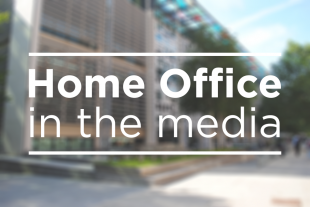 Today's Home Office stories include on crime levels, fire budgets and landlords' concern for citizens' rights to rent. There is further coverage in the Times, Telegraph (splash), Mail, Mirror and Sun reporting that crime is set to rise over the coming years with children, elderly people and vulnerable adults at particular risk of harm, according to police chiefs. The articles note that chief constables fear the number of offences will increase due to a surge in cases such as fraud, cyber-crime, child sexual exploitation and slavery. The warnings emerged in the first self-assessment forms in which chief constables disclosed the demand their force expects to face and whether they have the resources to cope. The reports say that statistics collected by Channel 4’s Dispatches from 25 forces show that 27 per cent of reported crimes had been screened and then dropped after that initial assessment. The Times notes that the new figures show that an average of one in three burglaries is screened out, with significant differences between forces. “Police have the resources they need to carry out their vital work and we have provided a strong and comprehensive settlement that is increasing total investment in the police system by over £460m in 2018/19, including increased funding for local policing through Council Tax precept. There is reporting in the Telegraph, Star, PA and Metro of claims that fire brigades are under-funded, short-staffed and ill-equipped to deal with an increase in wildfires. At least 25,000 grass and wildfires were tackled by fire services between May and July this year, of which more than two thirds were started deliberately, new figures obtained from a Freedom of Information (FOI) request reveal. A third of the 40 fire services which responded to the FOI said the number of grass fires and wildfires they attended had tripled when compared to previous years. Lighters and cigarettes, along with candles and matches, were the most common source of the fires, the Telegraph reports. “The tireless efforts of firefighters to contain wildfires this summer have been astounding. The Guardian reports that human rights groups oppose the Home Office’s plans to expand powers to strip dual citizens of their British citizenship. The piece notes that the Home Secretary proposed extending the reach of the power to cover serious criminals in his speech to the Conservative conference, citing child grooming gangs as an example. “Any British Citizen may be deprived of his or her citizenship if the Secretary of State is satisfied that it would be conducive to the public good. It is a power used for extreme and exceptional cases. There is reporting in the Guardian of landlords’ warnings that EU citizens living in the UK are at risk of facing difficulties caused by a lack of legal certainty around their status post-Brexit. The article states that the Residential Landlords Association (RLA) has written to the Home Secretary demanding that EU citizens are provided with a document to prove their right to rent. “EU citizens make a huge contribution to our economy and to our society. The Prime Minister and Home Secretary have been clear that – while we are all working hard towards achieving a deal – in the event of no deal, all EU citizens resident in the UK by 29 March 2019 will be able to stay, their rights will be protected and they will be able to live their lives broadly as they do now.